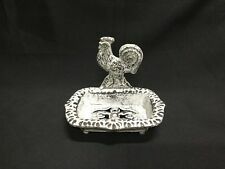 (181-1001) This antiqued white cast iron rooster soap dish will shine on your countertop. It measures 4.25" H x 5.5" W x 3.75" deep, and has rubber feet to protect your counter top. 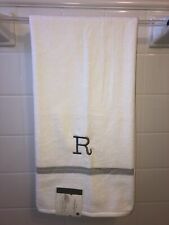 NWT~ Threshold Monogram Bath Towel White with Gray "R" New Bright White THICK! Make your family feel extra special when you hang a Monogram Bath Towel on the towel bar. This is a quality towel - really thick and soft. Bright white with gray embroidered "R". Thick and luxurious! ~Excellent whiteness. 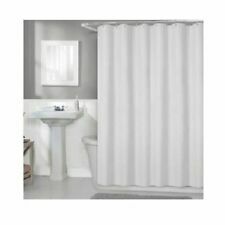 Luxor Platinum Bath Towel 12 Piece Set ~Contains 4 - 27 x 54 Bath Towels. -Bed and Breakfast. ~Contains 4 - 13 x 13 Wash Cloths. Premium Quality! 4 - 13 x 13 Wash Cloths. ~Contains 4 - 16 x 30 Hand Towels. The white Irish Linen Madeira Dot Guest Towels (set of 2) with hand embroidery are each 14" by 22". Sonoma Fringe Bath Rug White. 20 in x 30 in. Condition is New with tags. Shipped with USPS Priority Mail. Soft and absorbent these functional towels will fit any use they are needed for. 6 Piece Towel Set - 2 Washcloths, 2 Hand Towel, 2 Bath Towel. Washcloth size :13"x13" Hand Towel Size: 19"x35" Bath Towel Size : 27"x55". This combination creates a powerful impression of nature and relaxation. The dispenser is ideal for daily use in the bathroom or kitchen, and is the perfect addition to the life of anyone conscious of careful design and striking aesthetic. The Pure Cotton Navy Double Stripe Guest Towels are each 14" by 22" and feature two small navy blue stripes across the entire bottom of the towel. What a lovely gift! Perfect for all gift giving occasion. Designs at both end of the towel are hand crochet. Length 31" Width 19". Dragon with Wings- Colorful Playful HS1278. 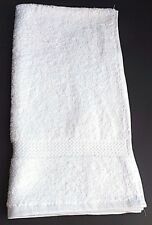 Embroidered/ Appliqued Bathroom Hand Towel White - 100% Cotton. Design is approx. 4" x 4" Hand Towel 16" x 26". Kate spade new york Chattam Stripe Bath Towel in White. Indulge in the comfort and luxury of the kate spade new york Chattam Stripe Bath Towel. Crafted of high quality cotton, this ultra absorbent bath towel boasts clean lines and a silky, soft feel that provides exceptional comfort. These are nice white hand towels. ~Excellent whiteness. ~Machine washable, tumble dry on low. ~Superior Quality. Oxford Imperial Hand Towel ~Double stitched at hem. ~Extra strong. -Fitness Centers. Finger Tip Towel Monogram Letter "N". NOTE : On the back of towel picture. the spot that looks yellow is the. Color: White w/Silver Gray Letter/Scroll Design. This is an original, new in box Pre de Provence soap dish. It has the dove logo on the bottom of the dish. The dish measures roughly 6.5” x 4.5” and are designed to fit the Pre de Provence soaps. These are embroidered, NOT screen printed for long lasting quality. Rush orders can be accomodated if requested. Designs at both end of the towel are hand crochet. Length 35" Width 19". Blue Stripe Pool Towel ~One blue stripe down the center. ~Affordable pricing. ~Absorbent. -Fitness Centers. Fox laying in flowers HS1137. Embroidered White Bathroom Hand Towel. Best Teacher Ever- Occupation HS1135. Embroidered White Bathroom Hand Towel. Best Teacher Ever- Occupation HS1134. Embroidered White Bathroom Hand Towel. Oxford Gold Wash Cloth Order includes 12 wash cloths, other towels pictured are not included. ~86% Cotton/14% Polyester. High Quality! ~Extra strong. ~Excellent quality. ~Ring-spun. ~Ideal for. White Towel Services Pre-Moistened 100% Cotton Refreshment Towel 8 Rolled Lavender 50 ct.
Deluxe Wash Cloth Order includes 12 wash cloths, other towels pictured are not included. ~100% Cotton. ~Extra strong. ~Excellent quality. -Auto Detailing. Love is a four legged word- HS1073. Embroidered White Bathroom Hand Towel. Design is approx. 4" x 3" Hand Towel 16" x 26". ~Excellent whiteness. Luxor Bath Towel ~Cotton/Polyester Blend. ~Double stitched at hem. ~Superior Quality. ~Extra strong. ~Ideal for. Deluxe Wash Cloth Order includes 12 wash cloths, other towels pictured are not included. ~100% Cotton. ~Extra strong. ~Affordable pricing. ~Excellent quality. -Auto Detailing. And now, with a choice of bright white or dark grey, you can choose the color hand towel to match your linen or room. Enjoy having extra towels at hand without the rush of laundry. EASY CARE: These wash towels are perfectly machine-washable and they dry very fast too. Oxford Gold Wash Cloth ~86% Cotton/14% Polyester. Order includes 10 wash cloths, other towels pictured are not included. ~Extra strong. ~Affordable pricing. ~Excellent quality. -Auto Detailing. Toothbrush holder with suction cup, white. The STUGVIK series is an easy way to organize – in white or with a playful splash of color. Oxford Gold Wash Cloth ~86% Cotton/14% Polyester. Order includes 12 wash cloths, other towels pictured are not included. ~Extra strong. ~Affordable pricing. ~Excellent quality. -Auto Detailing. Double Robe Hook. Genuine Porcelain. Size: 72x90" Oval. Beautiful embroidered cut work flower fabric tablecloth. Color: White. New with tags white face cloth towel from Threshold. Non smoking home. Palm Tree Doodle in Green colored thread HS1136. Embroidered White Bathroom Hand Towel. 4 _ Pack 11" x 18" _ White Fingertip Towels 100% Cotton - Terry-Velour.